Why Are You Fighting 98% of the Population for 2% of the Wealth? Estimates vary, but for the sake of the argument, let's say that 98% of the wealth in the world is owned by approximately 2% of the population. Give it a couple of percentage points either way because it doesn't really matter. The 98% of the rest of the world fights tooth and nail to get a piece of the remaining 2%. Why? Probably not. Like many entrenched processes and systems, the financial structure we currently have happened over time as those with wealth creation mechanisms (companies and investments) simply kept adding to their resources. Remember that fiat currency was originally designed to make trading more convenient. Currency allowed us to trade for goods and services without having to directly barter one good or service for one other good or service. Then people found they could make money as an income. The imbalance of the trade, the spread or profit, is where wealth is created. If you are able to trade and retain a portion of the currency, you are storing wealth. Then you hire people, pay them a flat rate and add more income capacity. Income streams are the key to wealth creation. Jobs are where the differentiation between wealth and survival begins. Those who create wealth – 2%. Those with standard paying jobs – 98%. There is a middle class, managers and mid-level pay that is above par, but that class of people is quickly disappearing. The rest of the population has jobs that just get them by and do nothing (comparatively) to add to their savings and overall bottom line. When we “woke up”, 2% of the population had accumulated 98% of the available wealth. We discovered there was no real way to realign that wealth so we resigned ourselves to the fact that it will never change. The wealthy constructed our monetary system and we learned from a very early age that we can only operate in the current fiat structure. We were told that we have to do everything we can to scrimp and save and live within our means. This is how we learned to give ourselves comfort and security. Do you feel well-off, comfortable or secure? The resource most precious to everyone, regardless of who they are, is time. That is another story for a different day. The primary point is that money is not the most valuable resource. It is transient and has limiting factors. Additionally, fiat currency used to be backed by physical resources such as gold, but now it is simply an agreement between a government and its users that it is worth something. It is a perceived value based on nothing more than a promise. What makes it transient is that it can change. When a government’s credit rating decreases, when it is no longer tied to the value of another resource (oil), then it can change – become stronger or weaker. What is the perceived value of the USD, especially given the national debt? Is our longer-term outlook positive or negative? An economy, including fiat and currency value, is a very complex mechanism. To simplify the concept, let’s just look at the fact that populations have revolted when their government has mismanaged currency. What can make this happen? The primary contributing factor in a failed currency is inflation (or hyper-inflation) where a currency devalues and, in an effort to maintain liquidity, the government simply prints more. Increased supply pushes currency value further downward and it becomes a vicious spiral until people can no longer make enough to survive much less thrive. For the wealthy, some will lose their fortunes. For many, it is an inconvenience as most companies and even investments have mechanisms to auto-correct for inflation. If not, then typically some portion of assets will be moved to an adjusted investment vehicle. It isn’t rigged, it is just the same thing any other person would do. The one commonality is that any monetary system is owned by the government and government is the anti-thesis to operating efficiently. A government will add to debt, add to monetary supply and manipulate currency value always in favor of the sovereignty. Nobody, including the wealthy, is exempt from this fact. But we digress from the primary topic, which is wealth accumulation. For the first time in modern history, there is an opportunity to realign wealth around the globe. To create income streams in a format outside the rules of the fiat system. One that is not managed by the government and not fiscally manipulatable. What if there were a decentralized currency based on a peer-to-peer structure that is completely free market and subject only to the rules of its users. What if you could create income streams, collect it, hold it as a store of value, it would never inflate as the supply is static and you could begin trading it for goods and services. Welcome to the cryptocurrency revolution. The first Bitcoin block was mined January 3, 2009. Since then 1000's of digital currencies have been launched and the future of cryptocurrency solidified in the history of man. The naysayers said it would never work and the money men of Wall Street discounted it as nothing more than a hoax. Jaime Dimon, CEO of J P Morgan who made in the neighborhood of $33B last year, will earn about $33M in salary and bonuses. 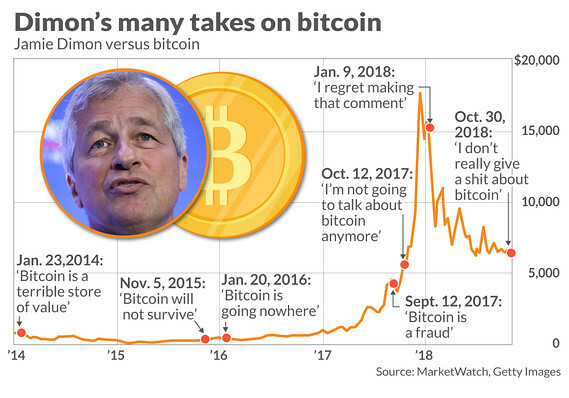 Since January of 2014, Dimon has been the most vocal skeptics of Bitcoin and Crypto, but his feelings are nearly universal in the money houses around the globe. Why are these people pushing so hard against Bitcoin and Alt-coin as a currency in the marketplace? The reason is simple. It upsets their apple cart. The problem is that they can't stop it, so they are changing their story. Remember how he said it would not survive? Guess who is launching their own digital currency. If you guessed Jamie Dimon and J P Morgan, you would be correct. The world needs skeptics too. If you are planning on sitting around and waiting to see if this whole digital currency thing takes off, let's take a look at some current events and see if that is the wisest move. First, Bitcoin has followed the same pattern since its inception back in 2009. The curve it is following is one of pre-adoption, that is before the tipping point where it is widely accepted as a currency. One more solid run-up is anticipated before it settles into a longer-term growth curve. Take a look at the historical charts. If we take apart the pattern, then it makes sense. Early adopters get it, price starts going up, more people get in driving the price up, then FOMO kicks in and prices soar. Once it hits a certain point, profit taking occurs and price drops to a point where investors start buying back in. This is the pre-adoption stage and other coins will more or less follow this pattern with bitcoin as the leader until there is an event which separates the two. Once the market hits a tipping point, where vendor transactions outweigh the impact of investment purchases and sales, the currency will normalize and assume more of a market curve. We anticipate this to occur after the next major market move. So if you are still a skeptic, you may want to rethink your position. If you are thinking that you missed the boat, you might want to rethink that as well. This digital currency thing is just getting moving. Add to that, the blockchain is more than just a coin. It is a mechanism of peer-to-peer sharing that makes data on the chain immutable. It is like public records on steroids as it can be shared across everywhere and cannot be changed because the person hosting the data is everyone in the network. So how do you start changing the game? Start transacting in coin. If you have a website, put in a payment gateway for coin. If you have onsite sales, you can start taking coin easily through major merchant payment systems. If you want to buy in coin, search for any vendor around the world. You can find them here on WhoTakesCoin. Don’t know how or want to learn more? We are happy to answer whatever blockchain questions you may have. List your product or service free or upgrade it to feature your offer. You can use coupons and list multiple services. If you have questions, we can help. We are your go-to blockchain service provider.